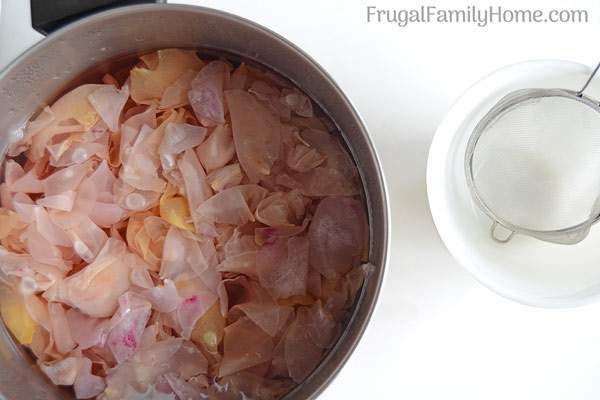 Have you ever wondered how easy it is to make homemade rose water? In the past, I’ve purchased rose water but it can be expensive. If you have roses you can make your own rose water, and it’s so easy to do too. Some of the links in this posts are my affiliate links. 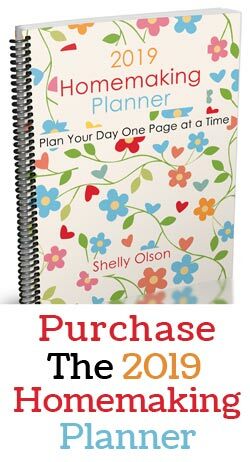 When you buy through them I can make a little money at no extra cost to you. Thanks for your support in this way. See my disclosure page for more information. Making homemade rose water at home is pretty simple. I was surprised at how easy it really was and wondered why I ever had purchased it? Since we’ve been growing roses at our current home for about 20 years in the spring and summer I have a nice supply of roses on hand. But it never occurred to me to make DIY rose water until I had a bunch of roses that needed to be trimmed before a few days of rain arrived. I thought it would be best to get the huge blooms off the rose bush before they filled with water and broke the stems or the petals were knocked off all over the ground. I didn’t want to have to clean up a huge rose petal mess. But I didn’t want to just throw those beautiful roses into the compost. I put some in a vase to enjoy and the rest were used to make this homemade rose water. I made a video to show you how easy it is to make your own homemade rose water. View it below or scroll down for the basic written instructions. ✳︎ Start with organic roses. When making products from flowers it’s important to use organic flowers. You don’t want to have those pesticides or herbicides ending up in your homemade beauty products so be safe and use organically grown flowers. We grow our own roses organically and treat them with natural pest deterrents. Our roses aren’t perfect but they thrive and look good in general. They aren’t perfect but then again what in nature really is and if everything was perfect how boring would that be?! ✳︎ Remove the rose petals from the stem. You can do this one at a time or you can grab the full head of the rose and twist a little at the base of the bloom and most of the petals will come off. We tried both ways. Some roses were easy to remove all at once, others it was easier to do it one petal at a time. Use whichever method works best for the roses you have. ✳︎ Wash the Petals. Once the rose petals are removed you want to wash them. We found a few bugs and a little dirt on the rose petals. Put them into a bowl with water or in a colander and rinse them well. Then drain. ✳︎ Simmer the Rose Petals. 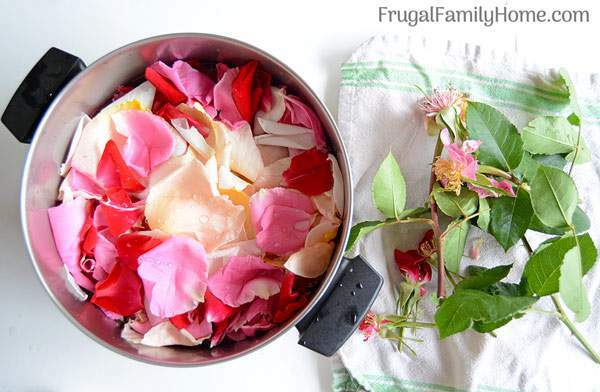 Once the petals are nice and clean place them in a large pot and cover them with distilled water. You just want enough water to cover the petals. You don’t want too much water as it can dilute your rose water. The petals will float a little that’s ok.
You’ll want to simmer the rose petals on low until the color is gone from the petals. They will look pale and a little droopy. I let mine go about 15 minutes. Then remove them from the burner and let them sit to cool a little. ✳︎ Strain at Rose Petals. Once the rose water has cooled, strain the rose petals out of the water. I like to scoop the rose petals out and then as I’m pouring the rose water into a clean canning jar I strain it through a tight mesh colander. Once your rose water is cool place a lid on your jar and store the rose water in the refrigerator. I place mine in the back of the refrigerator to keep it cold and to help it last longer. You can use rose water as a toner. I place a small amount of rose water in a bottle and soak a cotton ball with it. Rub on your face like you would use a toner. You can dilute the rose water 3 parts water and 1 part rose water if the straight rose water is too astringent for your skin. You can use rose water to set makeup. 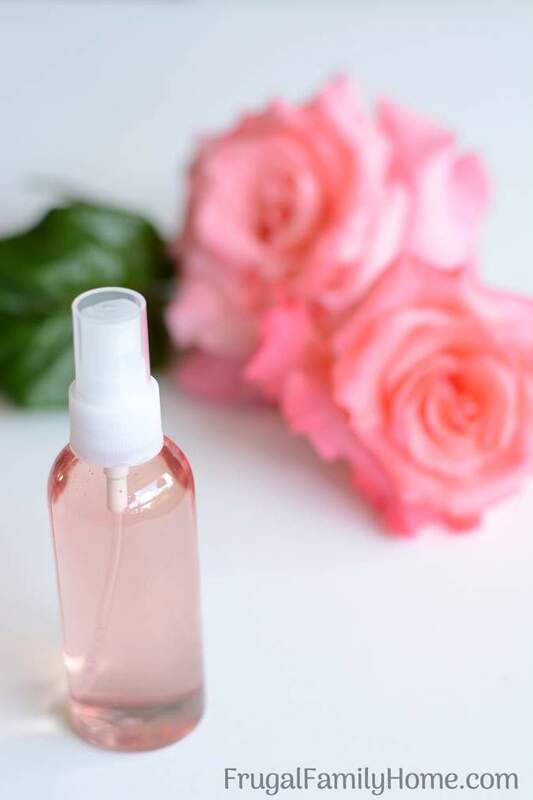 Place your homemade rose water into a spray bottle and spray a little on your face to set your makeup. Add it to your bath. Add a cup or two to your bath for a rose scented bath to soak in. Use Homemade Rose Water to freshen your skin. 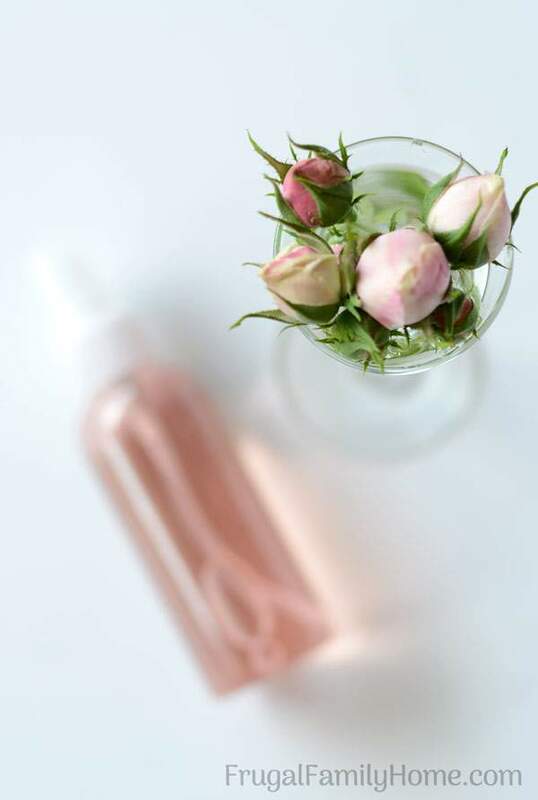 In the hot days of summer, you can use your rose water to spray on your skin to freshen it. Plus the lovely rose smell is a great bonus. What do you think? 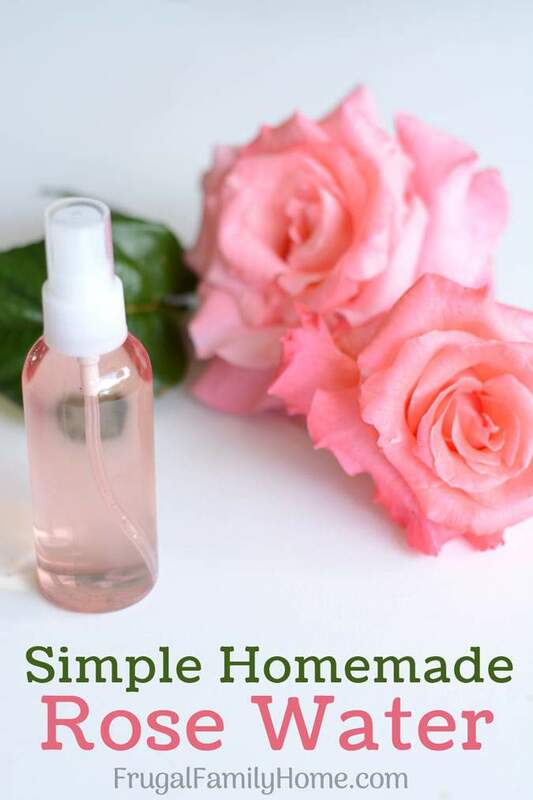 Is making homemade rose water on your list of things to do now that you know how easy it really is to make? I hope so. If you give it a try be sure to leave me a comment and let me know. 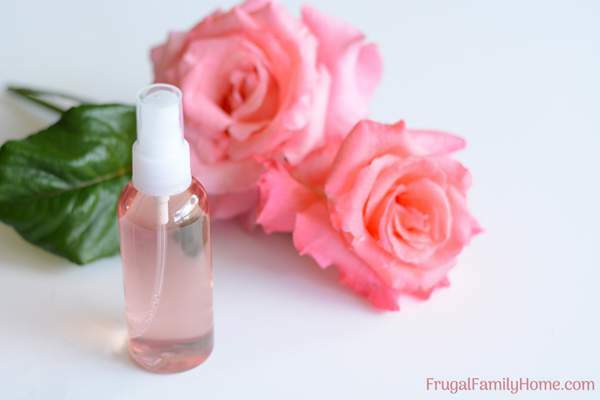 When you make your own DIY rose water you can save money and be pampered at the same time! I don’t fertilize my roses, but they don’t have strong fragrance – would rose water have any fragrance? Does the rose water give you any nutrients? For stain remover I use Fels Neptha soap – works fantastic – but you have to rub it in and leave for 10 min or so. Laundry detergent I make equal parts of: Fels Naptha soap bar and 1c. Arm and Hammer washing soda and 1 c. of 20 mules borax . I don’t know if it’s natural enough ingredients ? Barb, Some roses don’t have much or any fragrance. If you used a rose with low to no fragrance your rose water wouldn’t have much fragrance. I try to use roses with the most fragrance to get the most scent out of it. As far as nutrients, I’m not sure I like the feel of the rose water on the skin and the scent. I love Fels Neptha Soap. I agree it works wonders on stains. 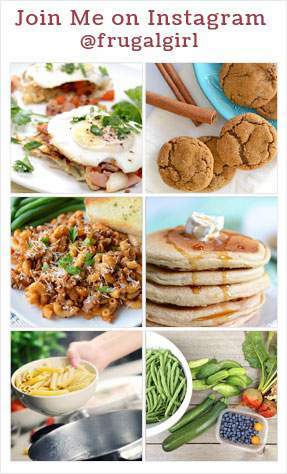 I want to make it!! My roses don’t have much smell. Will it still be effective as a toner? It should turn out fine Lynda, but may not have much fragrance. Hi!!! How long would the rose water last or be effective for? Would it even have an expiration date? Thank you. Stephanie, I keep it in the refrigerator and it kept for a couple of months but it will eventually grow mold, at least mine did. But that wasn’t for about 4 months. I wonder if you could freeze it for the winter months? I can’t think of any reason you couldn’t freeze it. What’s the pedal/water ratio & what size jar? Lourdes, I put in as many rose petals as I have and then just cover with water. So not really a ratio but just depends on how many roses you have to use. In the video that amount made 2 quarts. So would fresh roses from valentines day be ok to use or do they need to be grown at home. Natasha, you could use those if you’d like. I use homegrown roses because that’s what we have. Thank you sooo much for your direct and easy to use, and read site-on Pinterest. I am always looking to not throw away useful plants. This year I have committed to growing and harvesting as much useful and manicipal plants as possible. I’m glad you found it helpful, Rhonda. Did you ever add witch hazel to the rose water to preserve it longer ?? Linda, I haven’t tried adding witch hazel.